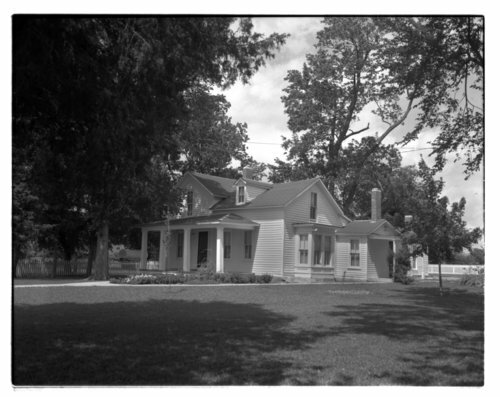 Multiple images of the Edward Hogue Funston home, located in Allen County, Kansas. The father of General Fred Funston was born at Donnelsville, Clark County, Ohio, on September 16, 1836, and married Ann Eliza Mitchell in September 1861. He served throughout the Civil War in the Sixteenth Ohio Battery. He moved his family to Kansas in December 1867 where he established a prosperous, diversified farm just north of Iola. E. H. Funston was an officer in the Kansas State Agricultural Society and the State Board of Agriculture and served in Kansas House of Representatives (1873-1875) and the Kansas Senate (1881-1885), before winning election to the U.S. Congress in 1884. Funston expressed interest in (and made some effort to obtain) the Republican nomination for governor and congressman from the second district and continued to use his powerful voice to speak out on issues of interest to him and many of his Allen county neighbors until his death on September 10, 1911.